Larry is an experienced litigator who defends professional liability cases including medical and engineering claims. 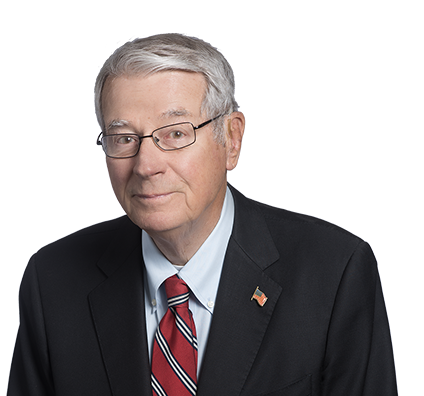 Having represented surgeons and physicians in Missouri and Kansas for more than 40 years, Larry has achieved many defense victories for doctors accused of injuring patients by substandard medical care. In addition, he has effectively defended engineers accused of design or performance failures, as well as aggressively opposing a number of significant product liability cases. Obtaining a complete defense verdict for healthcare clients confronting medical malpractice claims in excess of $6 million. Defending two physicians with favorable results in lawsuit over knee replacement surgery. Larry serves the healthcare industry outside of the practice of law. He currently sits on the Board of Directors for Saint Luke’s Home Healthcare & Hospice. He also has taught at the University of Missouri-Columbia School of Law. Secured favorable verdict for the family of a deceased Marine veteran in a wrongful death action against the U.S. Veterans Administration. Obtained a complete defense verdict, upheld by the Missouri Court of Appeals, on behalf of healthcare clients facing medical malpractice claims in excess of $6 million. Prosecuted a jury trial on behalf of the University of Missouri to gain permission for construction of the Mary Clark and E. Grey Dimond Scholar's Center at the University of Missouri-Kansas City School. Defended civil engineers accused of substandard professional work and won a $10 million jury case in federal court in Orlando, Fla., in which Amtrak claimed a derailment was caused by poor civil engineering at a rail crossing.